Let’s face it; there are a lot of ways your bird feeding dollars can be wasted. Squirrels are sure to put a dent in your budget as they devour everything in sight, not to mention the starlings and grackles that can dominate your feeders to the exclusion of the birds you really want to attract. Feeding a poor quality blend of bird seed from the grocery or hardware store can also be a waste of money as most of the undesirable filler seeds just end up rotting on the ground under the bird feeder. We deal with these scenarios all the time and we have the right bird foods, feeders and expert advice that will help you get the biggest bang for your bird feeding buck! Our quality bird foods target the specific birds you want to attract and discourage the birds you don’t. We have exclusionary feeders and accessories that can prevent those domineering squirrels, blackbirds and other nuisance critters from eating you out of house and home. 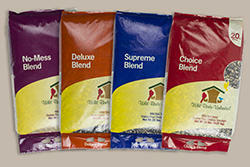 And you will not find a better value in bird seed than our quality WBU Seed Blends. With our regionally selected formulas, fresh quality ingredients and no filler seeds, you can rest assured that you will not be wasting any of your money on worthless, uneaten seed. We will also share lots of expert advice about setting up and operating your bird feeding area in the most efficient and economical ways possible. Give it some thought… if you are ready to take action, we are here to help you get more birds for your bird feeding buck! Ask about joining our Daily Savings Club Program! And don't forget our MyWBU Shipping Program!